The future of organizations is determined by the ways we choose to relate to each other. It helps to know where you want to go before you start down the path. Imagine an organization that functions perfectly. What do people believe about themselves in your perfect organization? How are you functioning in your perfect organization? How are people around you functioning in your perfect organization? What do people expect from themselves and each other in your perfect organization? What do you believe about yourself in your perfect organization? Organizations aren’t charts on the wall. They’re people down the hall. Perhaps your perfect organization runs like a tight ship. People stay in their place. What do people believe about themselves in tight-ship organizations? #1. Develop and preach a shared vision of the perfect organization. Who do we aspire to become? #2. Determine leadership behaviors that express shared vision. #3. Evaluate your behaviors against your vision. Adopt behaviors that reflect commitment to shared vision. Perhaps you imagine an organization where everyone is energized. What are you doing to fuel energy? How are you creating an environment where teams fuel each other’s energy? Maybe you imagine an organization where people need little oversight. Becoming a hands off leader won’t work unless people freely embrace responsibility and know how to hold each other accountable. 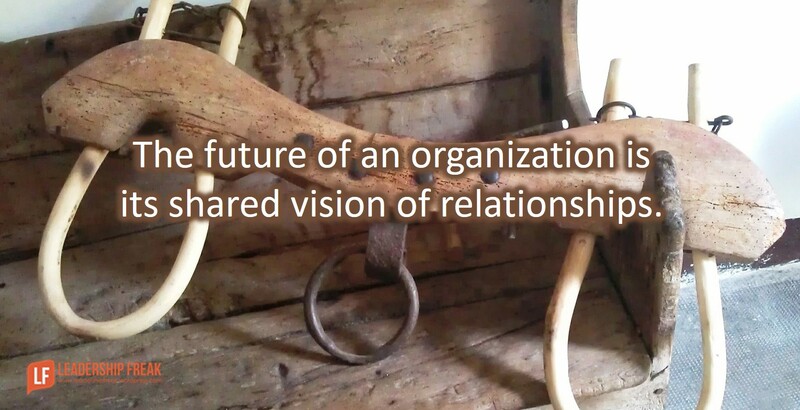 The future of an organization is its shared vision of relationships. How might teams/departments/organizations create shared vision for their relationships? How do your daily behaviors reflect the organization you hope to create? Growth requires community. We stagnate and die in isolation. Everyone needs seclusion to refresh and reflect. But growth requires connection. Who knowingly participates in your growth? Whose growth are you actively encouraging? Who knows your growth goals? Whose goals do you know? How might you establish and nurture growth-connections between team members? Thanks Paul. The word that stands out to me in your comment is “interaction”. Describe every interaction. Your five words offer a lifelong opportunity and challenge to find and affirm the behaviors that best express them. Thanks Dan. We do periodically discuss what behaviors align with and what behaviors don’t align with the five words. .
We probably have a shared vision – but not everybody is allowed to know what it is! Thanks Mitch. Well, you at least have an imposed vision. Perhaps one of the more powerful questions for all of us is what do people believe about themselves in the organization we envision? Dan, you right. I think one of the really dangerous things is the gap between what people believe about themselves and what the organisation believes about them! Is it really a vision if it’s not shared. Is it a vision if it’s imposed? What sort of shared vision was there in Mussolini Italy? one might argue: No shared visions, no shared future. Talk to people face to face. Sit across a table, listen and respond (NOT react). Do not be scared of what you might hear. If it is uncomfortable, get to the root and open it up, grow! Go into every situation open to listening and willing to speak. Until it is evident that hierarchy dictates action, offer opinion and feedback as an equal. I hope by what I have written above. I am trying very hard to get involved with and establish relationships with as many as I can. I have been surprised at the opportunities this has created for me and the frequency that others much higher than on the org chart, are now calling and asking for assistance. Will, your comment on “relationship health and wellness” is key to optimal organizational culture and peak performance. And it’s simply about how well we get along with others. Generally, persons who are unhappy or emotionally unhealthy are those who have difficulty getting along well with others and to some degree trying to control others by: Criticizing, blaming, judging, complaining, nagging, threatening, and disbelieving. On the other hand, persons who are emotionally healthy and happy enjoy themselves because they invest in their relationships by supporting, encouraging, listening, accepting, trusting, respecting, and negotiating differences. Healthy relationships are essential to professional and personal fulfillment–which yields much to any organization. Dan a very important subject especially in these days with firms like Uber who seem to have created a toxic culture full of litigation etc. I am reminded of what that other business writer Warren Bennis said. Leadership and Culture are the flip side of each other. If you have strong, focused and morally centered Leaders who communicate well, you will likely have a solid, enduring Culture. The few times I have created the perfect culture, I did it by fully, and I really mean 100%, meeting the five basic needs every person has: the need to be heard, the need to be respected, and the need for autonomy, competence, and relatedness. I did that by listening to what employees had to say more than enough to satisfy their need to be heard, and responding to what they said to their satisfaction or better to satisfy their need to be respected, even if it meant fully explaining why they coul.d not have what they wanted. By so doing, I was able to fully meet their needs for autonomy, competence, and relatedness. Oh you benevolent sovereign you, letting the rabble express themselves. The cultivation of shared vision is a two ways street. What you describe is not that. Thanks! This is really helpful for understanding my current work circumstances and, more importantly a path towards change. I work amongst multiple organizations that work with people whose lives are uncertain (people in poverty and homelessness) and so much of this work is shaped by what believe about and expect from each other. Thanks again! Great article on the importance of culture.”Culture eats strategy for breakfast.” I love the list at the top of the reply posts and will introduce this to my staff. To create the right culture, leaders must be intent and purposeful. It does not happen by accident. Coming from the DuPont safety world, I always challenged my colleagues that espoused the “Safety Culture” of the organization. Too much attention has been given to the so-called sub-cultures found in organizations. In my opinion, there is ONLY ONE culture in an organization and everyone and everything responds to that culture. Those who have gone through a corporate merger of two different cultures know exactly what I mean. Having lived through the quasi-merger/purchase of DuPont (Low Risk Culture) and Conoco (High Risk Culture) proved my point. The lesson here is don’t become trapped in the belief that your organization is comprised of multiple cultures because it will only make your efforts to capitalize on your culture more complicated and difficult. 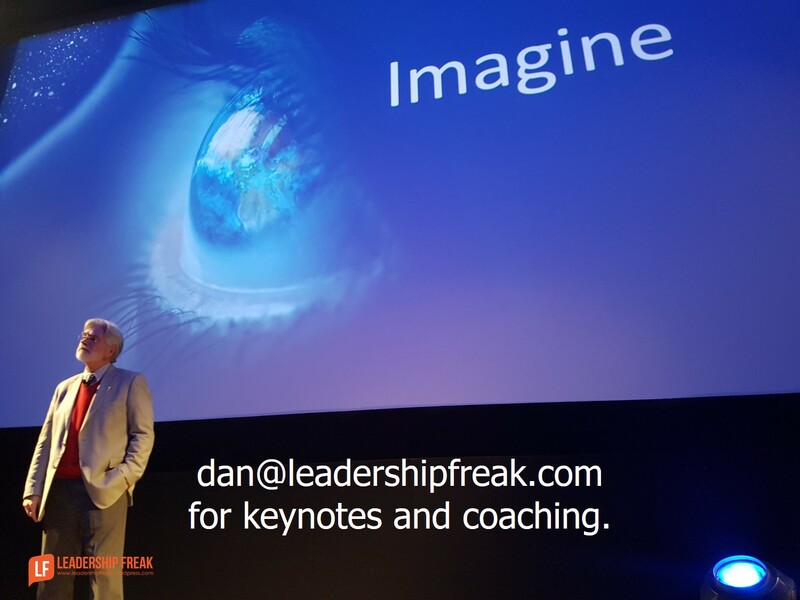 Dan, I agree with your post today and many of the comments offered above, but as I read this I find myself feeling like I am reading about culture looking in a rear view mirror. I would interested in your take on the culture paradigm of corporations going into the future, especially with the advent of the Gig economy. How does one capitalize on the use of “culture” when employees are going to be so temporary in nature – here today, gone tomorrow mindset? I believe we are entering an entirely new radical era when it comes to corporate culture that current corporate leaders do not appreciate or want to acknowledge and think the “old” tried and true ways of managing culture are still applicable. Failing to see this, I think, will lead to very difficult competitive times, especially when it comes to employee retention. I cannot help but notice how much the word VISION appeared in this blog posting…And I couldn’t agree with you more. In my professional life I have experienced both a healthy and non healthy vision. The problem-Collaborative and Cooperative efforts were either enforced or not. It was that simple. The success and difficulties any organization faces I believe stems directly from expectations of a vision one creates but that is why teamwork is of the essence.